[Go Back] [New Search] Details for Shinsui Ito (1898-1972) "Ishiyamadera"
Condition: Fine impression, color and state. 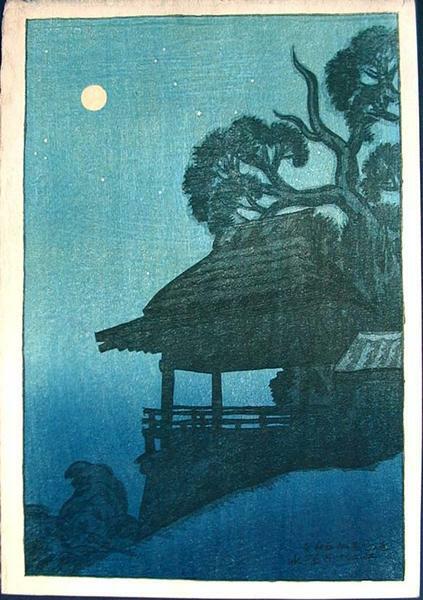 Notes: Regarding this print, Shinsui said; "This picture was made to satisfy my strong desire to reproduce the beautiful, sophisticated indigo-blue which is admired in the woodblock prints of Hiroshige". This series so impressed Kawase Hasui, that he decided to embark on a career as a print landscapist. A A SCARCE AND IMPORTANT EARLY SHINSUI PRINT!